The interviewer asks this question to ensure that you know the role of the job. In particular, he or she wants to see if you know what the key requirements are, what skills you need to excel, and how your experience matches up with the responsibilities of the job. Basically, interviewers are looking to see that your understanding of the role matches the interviewer's. To help prepare for the interview, carefully read the job posting, noting the stated requirements regarding skills and experience. You can also see if there is additional information about the job you're applying for on the company website. If the job listing is short, and there is little (or no) information on the company website, you can look up similar job listings on job sites like Indeed.com. You can also do an online search for the job title to get some general information. Before your interview, make a list of your skills and experiences that match the stated requirements. Think about specific examples of how you successfully applied these skills to other positions and bone up on how to match your qualifications to a job. When answering the question don't talk about how you would benefit from the job. For example, answers like, “I want a job that will help me build my career” make you seem more focused on yourself rather than how your background benefits the company. You also want to avoid answers that emphasize the job's perks, from health insurance to free lunches, or make it seem like the real appeal is employment and a paycheck. You'll also want to avoid a very generic answer. 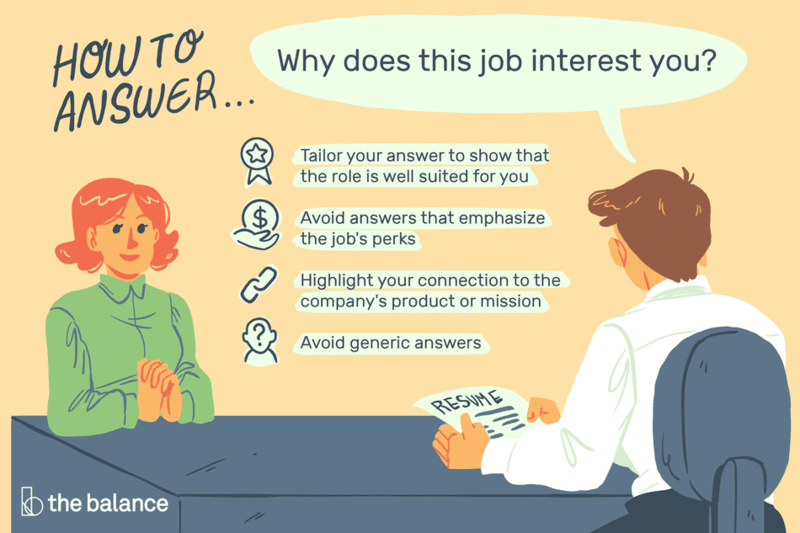 Instead, tailor your answer to show that this role is particularly well suited to your skills, experience, and interests, in a way that will benefit both you and the employer, that's idea. Be enthusiastic in your response, too. This is an opportunity to talk about what you find appealing about the position, and you should seem positive and eager to take on the role in your response. That said, you want to emphasize that you are qualified — as well as passionate — about the role. As much as possible, make it clear how hiring you will benefit the company. As well as mentioning how your skills and experience are a good match for the role, you can also highlight your connection to the company's product or mission, too. Customize these answers to fit your experience and the job you are applying for. I am interested in this job as a programmer because I am extremely interested in, and skilled at, learning and excelling at new technologies. I have already learned and mastered programs and languages ranging from Python to Java, and I look forward to mastering more programs as they're developed. I am also interested in creative problem solving, a skill I developed when working as an analyst for the past ten years. I am interested in this job as a special education teacher because I value your school’s mission, which is to focus on the unique needs of the individual child. As a special education teacher for the past six years, I have developed strategies for achieving academic and personal success for children, and I look forward to bringing these strategies to your school. For example, I developed a system for staying in regular contact with the parents of my students so that I could problem-solve issues with them. I would like to bring this kind of communication tool to your school.